Like Gordon Lightfoot’s “Minstrel of the Dawn” and Bob Dylan’s “Mr. Tambourine Man,” storytellers are always tempting you to follow them, as though through faerie rings, to the farthest reaches of tall tales, music, and imagination. We can’t promise you’ll return the way you were when you left the everyday land of logic, but you’ll find yourselves reborn in just the way the god of your heart intended. My parents’ parents read to them. My parents read to me. I read to my daughter. She reads to my granddaughters. I’m pleased to see the tradition continue. It’s almost as though it becomes part of our family’s DNA and the process is continued generation after generation. When my brothers and I cleaned out our parents’ house after they died, among the memories we found were boxes and boxes of our childhood books. Our parents’ generation inscribed books they gave as gifts, so the dates told us when the books first came into our consciousness. At one point, I thought my granddaughters might like them. It’s a bit disappointing to discover that the books I enjoyed when I was a kid no longer hold much appeal now. Today’s children’s books are linked to the children’s shows they watch on TV or at the movies. These grab their attention, whereas something I liked 3/4 of a century ago elicits a yawn. But that’s okay. On the way back from a day trip to Lake Tahoe, my oldest granddaughter was goofing around with stories about imaginary beings, some she made up on the spot, others that might have been prompted from some of the books her parents read to her. We joked about portals between our car and the car with the rest of the family in it as though such portals were a part of our everyday reality. I doubt that she remembers that conversation any more than I would remember a similar conversation with either of my parents from (give or take) the time of my 5th birthday. But the conversation told me her parents had been reading to her and that she had developed a wonderful imagination. I’m so proud of her for figuring out at her young age that there’s more to see that she can see with her physical eyes. As a writer, I suppose I have a stake in the tradition of kids being read to by their parents and then discovering the joy of reading as they grow older. But it’s not because I hope they’ll buy my books. It’s because I have felt the power of my imagination in my life and can’t imagine living in the world without it. Reading is a powerful catalyst to thinking outside the box and outside the brainwashing of the political forces of one’s time. Those with a powerful imagination may not have an easy time of it because they can see what others cannot see. They may grow up and find themselves out of step with the fads of the time. I know I did. But I wouldn’t trade understanding for conformity in spite of the temptations. When my parents read to me, I doubt they thought the reading would have an impact on my life. They did it because it was fun and because I enjoyed the stories. The same is true when I read to my daughter. These days, we know there are studies that show that kids who are read to by their parents have a better shot at life. Maybe some parents know about those studies and read to their kids as a duty. I can’t say that I approve of that. Reading is such a wonderful way of sharing a story with one’s children, that there’s no other reason to do it. They like the stories. So do we. Everything else in icing on the cake. Malcolm R. Campbell is the author of the Florida Folk Magic Series of three magical novels now available as an e-book in mutlipe formats. Here’s a personal example that surprised me at the time, first that it happened at all, second that it was vivid and intense. In a discussion group composed of people who at taken one or two Silva Method courses, we often talked about visualizing healing energy flowing from ourselves to other people. Usually, these were people we knew were sick, and the energy was sent after we relaxed our minds and closed our eyes and “saw” the energy as a beam of pure white light flowing toward (and enveloping) the person. Some suggested we could send energy to people we saw on the street or on a bus or in a room full of people. We’d simply imagine it happening without closing our eyes or using any self-hypnotic countdown of numbers to relax our minds. I tried this out on a dark country road that had a relatively small amount of traffic. My plan was to send energy to the people inside the cars as represented by pairs of headlights and tail lights ahead of me, on side roads at intersections, or in my rear view mirrors. When only a car or two was visible, I could “say” in my mind, “Healing energy is flowing into your car for all of you.” When traffic grew heavier, that changed to quickly saying “Energy to you” for each pair of lights. Even though I wasn’t far from home, the night was very dark, so I couldn’t possibly recognize any of the cars or the people in them. After doing this for ten or fifteen minutes, I began to “know” how many people were in the cars, whether or not any of them were really sick or depressed or happy or having an argument, and sometimes whether they suddenly felt a “jolt of health” or a “jolt of happiness.” Their thoughts and conversations were becoming strongly apparent. Soon, I was in tears because the impressions were so strong, the white light of the energy appeared before my eyes like flashes of lightning, and for some of the cars there came a validation that I was sensing actual moments and/or providing (through the energy) a bit of help. I was an emotional wreck by the time I reached my destination (my house) and sat in the dark driveway for a long time trying to process what had just happened. I have never tried to replicate this experience because the impressions and flashes of lights were so vivid, they were beginning to dangerously impact my driving. I worried that I might close my eyes without realizing it and end up wrecking my Jeep. First, it demonstrated that what begins as imagination can become more than that. It also showed me that the shift from imagination to intuition is most likely to happen when one isn’t trying to force it to happen. I thought I was pretending to send energy. Maybe it began that way, but it became an overwhelming validation that the process works. Second, it gave me the confidence–usually in an easy chair with my eyes closed–to send energy or “see” situations while my mind was in a relaxed (alpha waves) state. The experience showed me what it felt like when intuition has taken over. So, I was going to a place I knew. People using biofeedback to lower their blood pressure while hooked up to a flashing light that indicates their progress, discover (when the light slows down) what it feels like when the biofeedback works. This allows them to do it without the flashing light wired to their fingertips. If you practice intuition and/or various energy healing programs, including Reiki, “what it feels like” is a good guide to how you’re doing, so to speak. As a writer, artist, musician, or any other creative person who loves to let their imagination run free, I think we all discover in time that whether we’re writing a book or playing mind games, sometimes we learn things we didn’t expect to discover. Even now, I “know” (even though I’m not thinking about that old exercise) what kinds of people are in the cars represented by headlights and tail lights on the roads at night. Yes, I avoid those who seem malevolent or feel a kinship with those who are happy or depressed. One never knows why kinds of faculties an exercise will unlock. Malcolm R. Campbell is the author of magical realism novels where the magic and the realism are real. What if our muses are aliens from other worlds? Many of us learned the classical definition of muses in school. We had to memorize their names along with those of all the other Greek and Roman gods, goddesses, heroes, heroines, and ill-defined entities. When we studied long-dead writers whose books were part of the acceptable canon, we quickly saw that many of their muses weren’t from the pantheon, but were imagined as wispy, ephemeral (real or imagined) women who–when captured by artists–looked like they were dying of consumption or, possibly, syphilis. I told my professors I didn’t want anyone or anything like that hanging around giving me writing advice. This met with disapproval. Later, when my muse showed up on a dark and stormy night, she turned out to be a whisky-drinking, spell-casting woman who looked (I’m not making this up) like a hell’s angel biker. She had a “write this or else” kind of attitude. It took us a while to come to an understanding. But now I’m starting to wonder if all those Greek goddesses, consumptive women, and more modern whisky-drinking muses are illusions or, worse yet, aliens taking their instructions from a fully cloaked mothership in orbit around the earth. I often thought cats got their instructions from a similar source, but that’s another post. So, here we are, slaving away writing fiction, all the time thinking we’re making it up, using our imaginations, joking about what our muses want and don’t want, &c., when it turns out, we’re drones taking dictation from a race of beings from (possibly) the Klingon Empire who want to hack into our brains and influence our destiny via what we perceive to be home-grown works of art, music, drama, and literature. Sort of like the matrix, but worse. I’ve tried a variety of witches’ and conjure women’s spells, but they seem (so far) capable of getting rid of haints, demons, and the hexes from bad people. Muses are another kettle of spirits. So far–after a lot of dutiful testing–I’ve learned that they’re susceptible to booze. Here’s what that means. You’ve got to practice learning how to hold more liquor than your muse can hold. When she’s drunk and you’re not yet drunk, you can write, paint and compose without interference. For me, that means keeping a bottle of single malt Scotch and/or a quart jar of moonshine on the desk at all times. If you want to be your own writer rather than the pawn in somebody’s cosmic game of chess, you might want to consider the benefits of this approach. Sure, you might go broke or die of liver failure, but that’s a small price to pay for the sanctity of your art. Malcolm R. Campbell is the author of “Eulalie and Washerwoman” and “Conjure Woman’s Cat,” novels he wrote while trying to get rid of haints. Let’s go out on a limb here with this idea. . . The term “scrying’ is often called crystal gazing whether the medium/psychic stares into a crystal ball, a mirror, or the clear surface of a bowl of water to help them “see” the future. I thought of the term while writing about Tarot cards because many card readers use a form of scrying to better understand each card in the Tarot deck. However, instead of staring at a crystal ball, they stare at the image on the card and, so to speak, imagine stepping inside the card to better see the image. If one does this often, one “sees” more than the symbols and drawings on the card and begins to imagine other things, visions or day dreams, perhaps, that begin as an active process of relaxed imagination and end up supplying information not previously known. Of course, you can do that with a photograph of a person, a house, an outdoor scene, or anything else and imagine what is going on there. Many writers do something similar when they write without necessarily thinking there’s anything like psychic ability or mediumship or fortune telling associated with it. What happens is this: when concentrating on a scene in the novel or short story in progress, the writer stops typing to use logic for puzzling out what needs to happen next in the story. They casually think about it. The imagination can be unleashed in much the same way a Tarot card reader’s imagination is given free reign while s/he looks at the image on a card. When a writer does it, they’re not telling fortunes. They’re better seeing the story, daydreaming it–in a sense–to learn what’s going to happen next. If you haven’t tried this, you can stare at your writing on the screen, say, an action scene or the description of a room or a character, with a “hmmm” kind of attitude. Basically, you let your eyes blur so that you’re not reading the words on the page over and over. Instead, you’re “looking at” or “stepping into” whatever it is those words are saying. If the words describe a room in a house, you’re pretending to be inside that room. If they’re describing a chase scene, you’re pretending to see the scene unfold before your eyes as though you’re watching a TV show. If you have a photograph or drawing of a real or imagined place setting where your story is set, you can do the same thing. Look at it and imagine being there and watching the action. Some writers have found this works when they’re doing research and find themselves staring at the words on the page of a book about the subject their novel is about. Suddenly, new ideas for the story begin too come to mind–rather like free association. Anyone who writes fiction over a period of time will find ways to jump start his or her imagination. Some of us idly think of our stories while driving or doing repetitive tasks. Others think about their stories while listening to music. And then, there’s being a crystal gazer (so to speak). All these things tend to put the author into the scene one way or the other so that the subconscious mind gets involved and shows you what you’re intending to do. It beats fighting with words on the page while logically trying to brute force the story into place. Malcolm R. Campbell is the author of magical realism, contemporary fantasy, and paranormal books and stories, including Eulalie and Washerwoman. 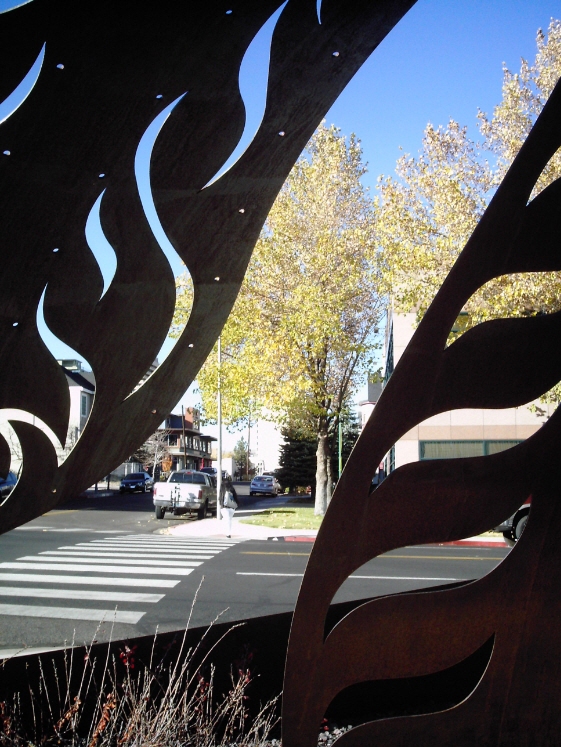 After a family visit to the Nevada Museum of Art in Reno, the adults rested on a stone wall while my two granddaughters burnt off energy racing around the adjoining Wilbur D May Sculpture Plaza. They were fascinated by the 19-foot-wide, 12-petal lotus flower created by sculptor Kate Raudenbush. Called the Guardian of Eden, the metal sculpture inspired Buddhist symbolism, Hindu and Egyptian creation myths, ancient Flower of Life symbol. Even though I was tired, I couldn’t resist seeing what my granddaughters saw while standing in the shade beneath the Guardian. Stand in an unusual place and see the world anew. The world looks very different from within the sculpture. My five-year-old granddaughter, Freya, liked standing close to the leaves and looking at the museum building and the others at that intersection through the holes. I can’t say what she saw, but I saw a world defined–created, perhaps–by the sculpture. The shade beneath the Guardian was part of it and so were the bits and pieces of West Liberty Street obscured by the petals. That which was visible by my changed perspective beneath the sculpture was more important than that which was covered up. In many ways, the sensation is like staring at the spaces between the leaves of a tree rather than focusing on the leaves. Children naturally explore their world and the, play with it–so to speak–by looking at it from slides and swings, by handing upside down on a jungle gym, peering at it through a stand of weeds, the hair of a doll or the holes in a colander. As writers, we do this, too. When we do, what do we see? What do we imagine? And what new stories can we tell? It’s fun to speculate about such things and then go out and create one’s own adventures. Malcolm R. Campbell is the author of contemporary fantasy, including the recently released “The Betrayed,” a story of lies, deceit and corruption on what appeared to be an Edenic college campus. Click on the banner to grab your Kindle copy today. 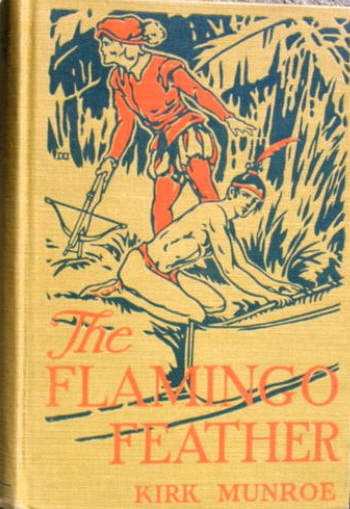 While growing up in Florida, my secret story often sounded like old Florida adventure novels. Some of the actual events merged into a short story or novel come from an author’s experiences. For example, my Kindle short story “Moonlight and Ghosts” draws slightly on my experience as a unit manager years ago in a center for the developmentally disabled. Other events in an author’s work come from what author Theodora Goss describes as one’s secret story. A secret story, often begun in childhood, is the story we tell ourselves about ourselves, a lifelong imagination-run-wild romp of the things we fantasize about doing or being. In childhood, many of us imagine being wizards or Knights of the Round Table or Superman. As we grow older, perhaps we change our story to make it more plausible. These stories can be, but usually aren’t, the same as our dreams and goals. Perhaps they come to mind as an all-in-good fun episode we imagine while we’re falling asleep or mowing the yard. Perhaps they have a deeper impact and become our personal myth. What ever they are, we seldom tell them to each other. Yet, to a writer, they are so much a part of his/her imagination, selected fragments of them wind up in stories or, in some cases, serve as the catalysts for stories. I wonder if we become truly happy and/or in a state of bliss when our secret story and our daily life become one. Before that happens, these stories are a great source of ideas for the next novel or short story. I have brought back my “Book Bits” writing links posts twice a week on my Sun Singer’s Travels blog. Each post includes 8-10 links for recent book news, reviews, how-to articles and features. Or, see my website for my latest news. Contemporary fantasy for your Kindle. We often hear people say they’re feeling centered or feeling uncentered and take such comments to mean they’re having a good day or a bad day. True enough, but for those who want to know the true unity of the self, there are deeper personal explorations and stories to discover, tell and experience. As I often suggest in my fiction, discovering the transcendent magic of oneself is often difficult in a science and technology world where we’re directly and indirectly taught as children that “the answers” come from books, experts, and the latest polls. Years ago, we used to say that everything that influenced a child to seek answers outside himself/herself was akin to programming, and that by the time one reached adulthood those programs were often “running in the background” and very hard to get out of one’s system. That said, I’m pleased when I see fiction and nonfiction for children that encourages them to think outside the box and discover the power and joy of the imagination. That’s how we get to the unified center of ourselves. The words “My Yehidah,” in Melissa Studdard’s new book My Yehidah: A Journal into the Story of You refer to an individual’s essential essence. Studdard’s writing prompts, in combination with artist Cheryl Kelley’s illustrations, offer children—in and out of classroom or camp settings—a wonderful and lighthearted way to take exciting trips into the worlds of their imagination. We might call this a personal voyage of discovery. The book can be used in combination with Studdard’s novel Six Weeks to Yehidah (reviewed here in August), showing young readers how the fairytale protagonist Annalise learned to explore her magical dreamscape; or it can be used as a standalone volume with or without adult mentors (parents, teachers, camp counselors, workshop facilitators). The workbook was a joy to read and almost made me wish I was a kid again with no pre-programed horizons in front of me, setting off on my journey into my own center with a box of stories, some crayons and colored pencils and a copy of My Yehidah: A Journal into the Story of You as my private drawingboard.